If you already have registered or have demo account you can download EXANTE trading platform. If you have not registered on our website yet, please follow this link. Without a proper account, you will not be able to use the trading platform. Download the version that fits your operating system. After downloading the setup file, install the platform by following the steps of the Installation Wizard. The platform requires a constant Internet connection. If the Internet connection is available, the platform will automatically connect to our server after launch. You should see a dialogue window prompting you to enter the email address and password specified during the registration on our website. Enter your login (email address) and password into the corresponding fields. Select the environment you want to log in. Possible options are 'Demo' and 'Live', login and password are the same for both. 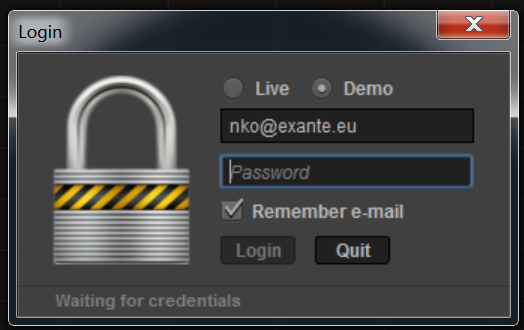 After clicking 'Login', if you have entered the correct access credentials, the dialog window will disappear, the modules will become active.